No doubt like many families, we have long thought we were lucky enough to have the best dog in the world. After all, there aren’t many who would take on a passenger plane in flight. But Jack did. Armed with only himself, Jack long ago gave up on birds to chase down airplanes flying overhead instead – any one would do, whether following the distant jet stream of a jumbo or the sound breaking barrier of a fighter jet from Williamtown, out on a practise run. Up the hill he’d run until he was out of sight – and we’d joke that one day he’d walk back down with the pilot. Once, we would have entered Jack into the ‘How High Can Your Dog Jump’ competition at the Nabiac Show, but it didn’t yet exist. 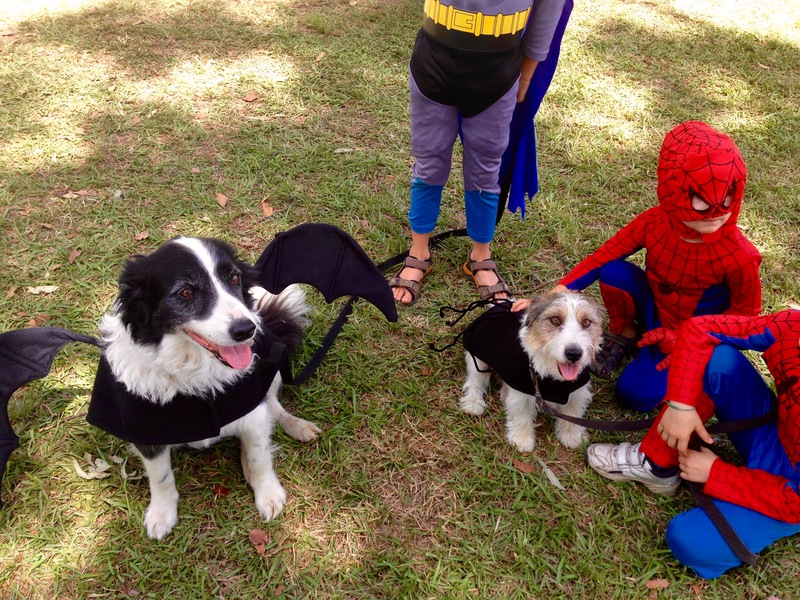 Instead, we settled happily for winning ‘Best Dressed Pet’ as Bat Dog and Spider Dog, with Bec H’s Jonesy instead. Once, Jack jumped so high, his black and white coat would ripple in the wind as he pushed upwards, twisting to catch the ball. Once, he ran so fast he looked like he had stepped out of a dog food ad. Dougal and I would stand 100m apart and call him just to watch him run, back and forth, his tongue hanging out like a propeller, fur streaming behind him. He loved jumping the waves, but was hesitant to lose his footing. We used to have one of those knotted rope dog toys, and he’d hang on with his jaw locked around it while we spun him in circles like a pirouetting duo. He gained a revolving pass into the house after insisting on coming in during his first cold night, ignoring the doors we had shut only to miraculously high jump off the narrow deck through a window screen, leaving muddy paw prints as he scrambled down the inside wall -“well, if he wants to come in that much, he deserves it,” we laughed. He slept in our room forever after that, on his own little makeshift bed. He’d bark at the horse (until it kicked him in the head), and chased the cows. And it was best to keep him away from chickens, especially since they weren’t ours. When Jonesy visited, they streamed around the yard relentlessly, two good mates on a never-ending race to nowhere in particular. We had to give up on the tennis-ball-on-a -string-totem-pole-thing – Jack chewed too many to bits. We lost thongs, socks… too many to count. When he hit 3, I remember us asking when his puppy phase would finally end. 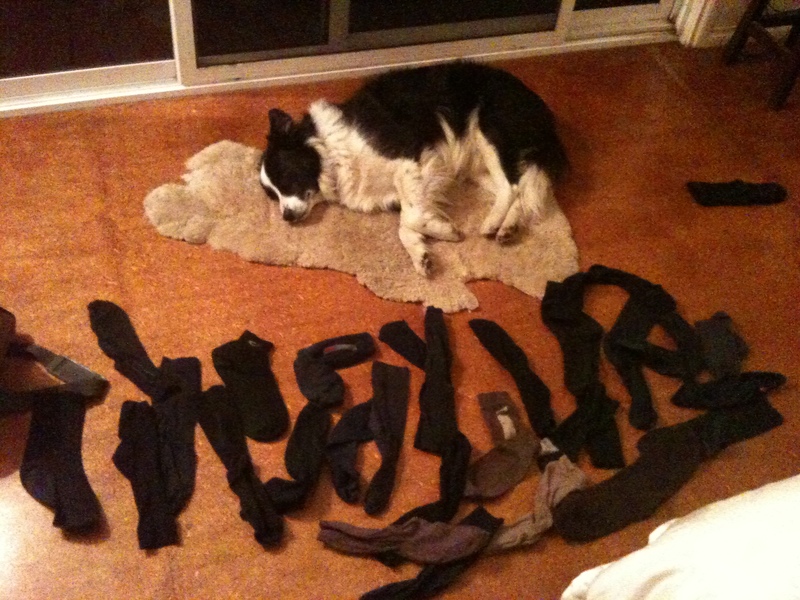 It took awhile, but they say border collies are like that. 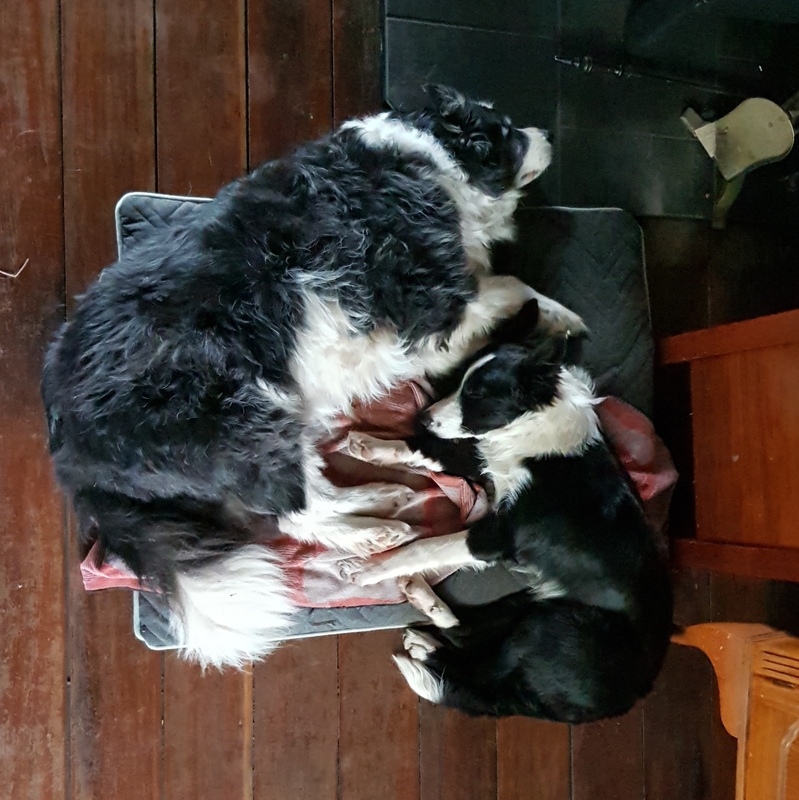 They also say border collies live long lives. And it’s true. These are just a tiny handful of the bucket loads of happy memories we have from 15 years of living with Jack. And this week I am learning that it is these we must find comfort in. I can’t say to myself ‘ c’mon, pull yourself together, he was just a dog’, because for us, he wasn’t ‘just’ a dog. He came to our wedding. He was a member of our family. In fact, we would refer to him as our first born son. Sometimes, I would try to imagine what he would say to me if he could talk. I’d imagine he would have a low, gravelly kind of voice, a little like Dougal actually but more doggy. Is that an odd thing to imagine? I don’t know, but it would make me smile. As Jack slowed down, he lost his sight, his steps became slower, his hips became stiffer. But he was content. We were content. As the years have passed, of course I have known the day to say goodbye was coming closer, yet it makes it no less easier. Recognising our reliance on his stabilising, comforting presence (who hasn’t pressed their head into their dog’s fur? Who hasn’t cuddled their dog? ), we opened our home to Steve the puppy two months ago. He has exploded into our lives and Jack’s, just as Jack once did to us. But I thought they would have longer together. On Wednesday, Jack woke and couldn’t stand up. Suspecting arthritic pain, the vet gave him an injection to treat it. It had worked before, but not this time. Comforting him in front of the fire at 1am the following morning, I realised I needed to let him go. Dougal, away overseas for almost six weeks, arrived home just in time to be with him and say goodbye. Had Jack been waiting for him? Who knows. I didn’t expect to find any solace in digging his grave, but strangely, I did. I didn’t expect to find any solace in burying him ourselves, but strangely, I did. I didn’t expect to find comfort from his grave, but I have. We all have, even the kids. Even Steve. Bereft, we traipse up several times a day to have a quiet word with him, alone. 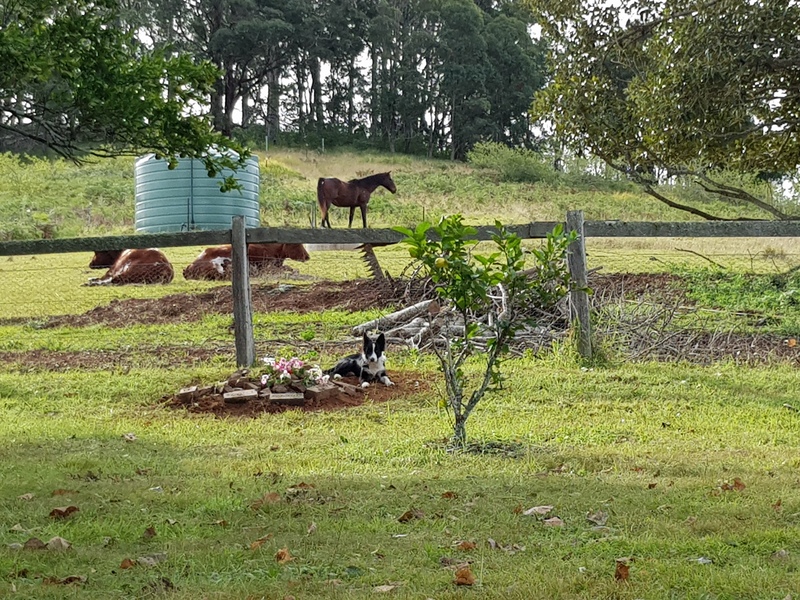 Jack’s spot has a view of his home, his family, his paddocks, his valley (he was a dog that always loved a view, like a lion on his throne). 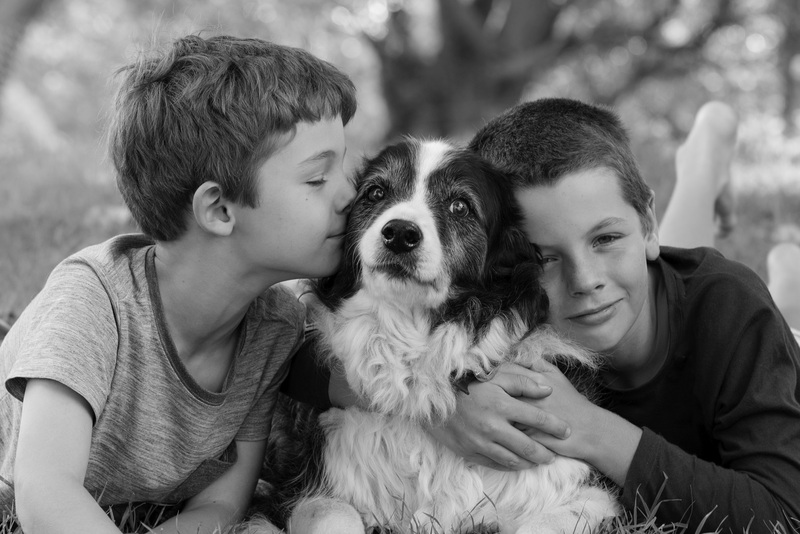 I read this week a beautiful quote about grief which ends,”grief is just love with no place to go.” Whether it’s referring to a person or animal, I don’t know, but it works in either case for the people left behind, no doubt with incomparable depths of intensity. As for Jack, as Dougal says, “he finally caught his plane”. We are just lucky the journey to catch it lasted so long, with us. *A special thanks to Dougal’s cousins, who gifted Jack to us so long ago. The best gift ever. This entry was posted in General, Living with animals, Uncategorized by Bec C. Bookmark the permalink. Alice! Thank you so much. Our hearts are heavy but I know time will lead us to thinking of him without tears. I hope you and Les are well, with some of your animal tribe still keeping you company?! I am saddened by your loss. Old Jack was a very special dog to you. I’ve never had a dog, but had had many cats and other animals. The decision to let them go when it is their time is never easy. Our oldest cat is now 22. Still doing fairly well, but I know time is running short. Dogs, cats, pigs… I guess they all have an impact on our lives once we let them in? Better to have loved and lost, than never have loved at all. 22 is an incredible innings – enjoy, enjoy, enjoy. Thanks you for your kind words Lavinia. thank you Brooke… Twas a hard one to write. Jack and Jones… and now Steve! Thanks for being his other family Bec H. Just think – he went his whole life without ever needing to go to a kennel! He was blessed with good friends… Time to write those children’s books. Hmmm. That’s tough. Really tough. And I know we’re heading into that same sad land one day. It’s worth it. The years of knowing them is gold. arrived home in time . Take care .